Has Sony added enough to warrant a Z2 sequel already? The Sony Xperia Z3 belongs firmly to the top tier of smartphones, and with enhanced design and greater power (well, sort of…), how does it compare to the rest? I would say that, despite being the 'worst' phone on this list, the Samsung Galaxy S5 is probably the closest competitor to the Xperia Z3 in terms of features and specs. It's less water and dust resistant (albeit only mildly so) at IP58 rather than IP68 for the Z3, but also has a fabulous screen with its Super AMOLED display, which has greater control over the colour balance than anything else on the market. The power and battery life are rather equivalent to Sony's challenger, and while the focus with the S5 is rather on the heart rate monitor and other slight gimmicks, it too packs a powerful camera (arguably better) and the same larger power pack. It's only design that really lets this phone down - and the Z3 is light years ahead in that department. The iPhone 6 should be more of a competitor to the Sony Xperia Z3 Compact, but it seems that most people will play it off against the larger model in their new phone choice. The iPhone 6 is a phenomenal phone, no doubt about it, but it's a very different proposition to the Xperia Z3. I'd argue Sony's option is all about power combined in a package that's easy enough to use, where the iPhone offers premium features but in a more straightforward phone. It's a tricky one to call, but the person that likes to tinker will find joy with the Sony Xperia Z3, with the camera and music settings providing a hotbed of toys to play with, and PS4 Remote Play is another good addition. But the iPhone just works. The picture quality of photos is great, the sound output strong (over headphones, not on the speakers, and especially not compared to the Z3) and the overall use simple to pick up. Still the best phone in the world, and not challenged by the Sony Xperia Z3. While you might prefer the power and settings choices on offer with Sony's option, the Z3 doesn't have the ergonomic design, powerful speakers and fast camera that the One M8 has, although it has more options for sure. The interface on the One M8 is more delightful, and although it doesn't quite have the battery life of the Xperia Z3 nor the camera power, it's a brilliant package nonetheless that just has users cooing over the design and little touches that make it easier to use. 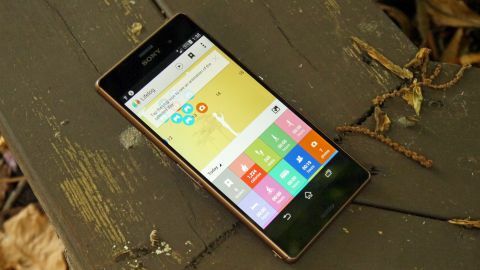 Again, this is more of a simple-to-use phone where things like MHL 3.0 on the Xperia Z3 will attract other users looking to connect their phone to a TV, but the One M8 is still the better all round package, if not as powerful. The LG G3 is a phone that's gained a lot of popularity for a number of reasons. Perhaps it's the QHD screen with the insanely crisp sharpness. Perhaps it's the tight packaging that allows users to hold a phablet almost like it was a smartphone. Or maybe it's the clear, flat user interface, combined with superfast camera, that impresses. If you're deciding between this phone and the Z3, it really comes down to handling. Both have great cameras but ones that overprocess a touch in low light. Both have very good battery life. Both are powerful with a large number of features to tinker with. Where Sony's option excels is the metal chassis, the much nicer screen (yes, it's lower res, but it also is brighter and more responsive as a result) and the longer battery life, despite both being good. It also has a decent interface, although I think most will prefer LG's offering in that respect. And finally - should you consider the predecessor? In this case, yes. I think the Sony Xperia Z2, when price is taken into account, is actually the better phone. The Z3 definitely has a more refined design and sits better in the hand - which is a very important thing. However, I noticed very little else in terms of upgrades throughout the phone, the DCEE HX audio upgrading seems to offer very little (and the fact that the difference between IP67 and IP68 is negligible for most users) and I struggle to see why else the Z3 is the better phone. The screen brightness is definitely one such area, but if you're really into the Sony ecosystem here's a phone that's as old as the HTC One M8 and Samsung Galaxy S5, yet a lot cheaper than both. The Z3 is the phone to go for if you're thinking longevity, but if you're going to buy one outright without a long term contract I'd be tempted by the Z2.